18-year-old North Delta Secondary graduate Kiran Johal hopes to find a stem cell donor at Wednesday's pop-up clinic at Guilford Town Centre. North Delta Secondary graduate Kiran Johal needs a stem cell transplant to save her life. Kiran Johal had just started her first semester of college when she started getting dizzy and noticing a significant amount of bruising on her body, some the size of her hands. A trip to the doctor turned into a trip to the ER and she was quickly admitted to hospital. Still, it wasn’t until she asked a nurse how long she would have to stay, explaining she had a midterm in the morning, that she realized the seriousness of her condition. “If you want to live, you’re going to be here a while,” the nurse replied. Reliving that moment brings Johal to tears. “It’s a scary feeling to know you can’t really do anything about it,” she said. The 18-year-old North Delta Secondary graduate was diagnosed with severe aplastic anemia and spent nearly a month a month in hospital receiving three to four transfusions a week. To date, Johal has received 21 transfusions during her treatment and is very thankful for the donors who helped save her life. “If those people were thinking, ‘No I don’t want to,’ I would probably not be alive today,” she said. Severe aplastic anemia is a rare condition wherein patients have less than 25 per cent of the normal amount of cells in their bone marrow and the stem cells that would become blood are damaged, creating a shortage of red blood cells, white blood cells, and platelets. In order to cure her condition and save her life, Johal desperately needs a stem cell transplant. 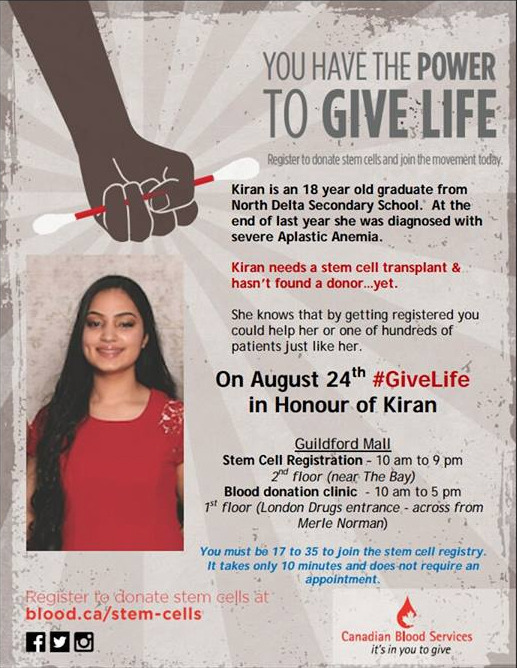 She says 70 per cent of matches are from unrelated donors who share the same background, which is why she is especially encouraging all eligible South Asian donors to come out to Guildford Town Centre this Wednesday, Aug. 24 and add their names to the stem cell registry. Wednesday’s stem cell clinic and blood drive aims to diversify the registry and inform the South Asian community that there is no risk in donating. Johal hopes the clinics will put patient like her on the road to a speedier recovery. Trudi Gols, territory manager for stem cell donations at Canadian Blood Services, said they need 17-to-35-year-olds to participate in the stem cell swab clinic. Taking part in the swab clinic will add participants to the national stem cell registry, making them potential donors for patients like Johal across Canada. In addition to registering as a stem cell donor, visitors to the mall can also donate some much-needed blood. “There is a need for all types of blood donors,” Gols said, adding the need for blood is constant. The blood donor and stem cell swab clinic is happening at Guilford Town Centre on Wednesday, Aug. 24. Both clinics open at 10:00 a.m., with blood donation closing at 5:00 p.m. and the stem cell clinic closing at 9:00 p.m. The blood clinic will be near entrance #6 (London Drugs/Scotiabank) and the swab clinic will be on the second level near Hudson’s Bay.